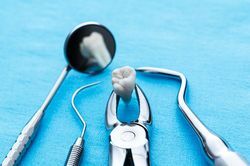 Dr. Jon Marc Van Slate will always do his best to save a damaged or infected tooth through root canal therapy or another form of treatment, but extraction may be the best way to preserve a patient's oral health and prevent future concerns in some cases. Fortunately, we perform tooth extractions at our Houston, TX, practice using the innovative Anutra anesthetic delivery system to ensure a comfortable experience. To learn more about our approach to tooth extractions, contact our practice today. When an infected tooth goes untreated, it can lead to extensive tooth loss and bacteria can spread to other areas of the body. During your initial consultation, Dr. Van Slate will evaluate your oral health and use digital dental x-rays to examine your teeth and determine if extraction is recommended. Dr. Van Slate performs extractions for the majority of cases. However, he will provide you with a referral if you require the extraction of wisdom teeth that are impacted. When you arrive for an extraction, we will first explain what to expect so that you can feel more confident about your procedure. Next, we will administer local anesthesia to ensure your comfort. Rather than using a traditional syringe to provide local anesthesia, we instead use the innovative Anutra delivery system. This system buffers anesthesia, which is a chemical process that neutralizes acids and bases. In addition to minimizing discomfort during an injection, buffering also allows patients to become numb more quickly. If you suffer from dental anxiety, we can also provide oral-conscious sedation. However, you will need to have someone drive you to and from the appointment if you undergo an extraction with sedation. After undergoing an extraction, we offer a range of restorative treatments to renew the appearance and function of your smile. Once you are at ease, Dr. Van Slate will begin the procedure. Using special techniques and a gentle touch, he will loosen your tooth to help minimize tissue trauma. He will then carefully remove your entire tooth. Once the procedure is complete, Dr. Van Slate will provide you with detailed instructions to ensure you heal promptly and safely. If you experience any temporary discomfort, this can typically be relieved with an over-the-counter nonsteroidal anti-inflammatory drug (NSAIDs) such as Advil or Motrin. After undergoing an extraction, we offer a range of restorative treatments to renew the appearance and function of your smile. Dr. Van Slate and our team are dedicated to providing patients with the best-possible care. Furthermore, we are committed to using the latest technology so that we can achieve optimal results with minimal discomfort. If you are suffering from tooth pain or have a tooth that is infected, contact our practice today to schedule an evaluation.